Corals died on a massive scale in 2015-16 due to hot waters, the worse global event in history and now in 2018 the bleaching has returned. In some places >90% of the corals have bleached and died. However, a few corals survived even in the hot water, but these "genetic treasures" are now being killed off by coral predators. 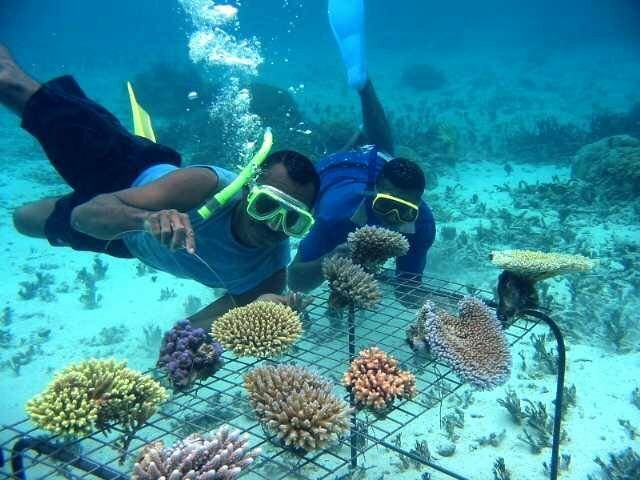 The project involves communities in predator removal, creation of nurseries of resilient corals, and out-planting second generation bleaching resistant corals to reefs. The massive global coral bleaching crisis has worsened again in 2018, due to unusually hot waters from El Nino. In bleaching the corals lose their brown micro-algae and they usually starve to death. Without corals, the reefs provide poor fish habitat and communities suffer. In the mass bleaching of 2000 in Fiji, we saw that 10% of the corals did not bleach, but unfortunately these surviving corals were subsequently killed by over-abundant predators, such as crown of thorns starfish, COTS. Communities will be empowered to save the lives of thousands of surviving corals that are resistant to warm water bleaching, but that can not survive the onslaught of over-abundant coral predators without help. These communities will restore patches of healthy corals to reefs by planting second generation climate-adapted corals of diverse species. Five villages in Fiji, or a total of 2,500 people, 2,000 people in Vanuatu, 700 on Christmas island Kiribati, and 3,000 in Tuvalu will benefit. German TV program on the coral gardening project. Cash bounty for the removal of ~50 crown of thorns starfish (@ 25cents each), representing the saving of some 18,000 fist-sized corals per year (COTS eat a fist-sized coral per day). Saving five coral genotypes resistant to bleaching, by incorporating them into nurseries protected from predators. Field scoping, trimming, and planting to the nursery. Funds an individual community youth leader to follow up with volunteers on the coral nurseries and with COTS removal for six months. Coral nursery of bleaching resistant corals: Metal bar "table" structure with suspended ropes and wire mesh trays used to grow "mother corals", trimmed at one year for replanting reef patches. Pays the cost for one community Coral health and Climate Change Adaptation workshop, preferably where existing no-fishing areas are already well established. Special project support for coral work in Vanuatu, in association with the GG Happy Chicken project sites, where small-scale chicken farming is being promoted as an alternative to overfishing. Strategy and workshops for Kiribati (Christmas Island), working with the Ministry of Fisheries, who have asked for urgent assisance with the corals.